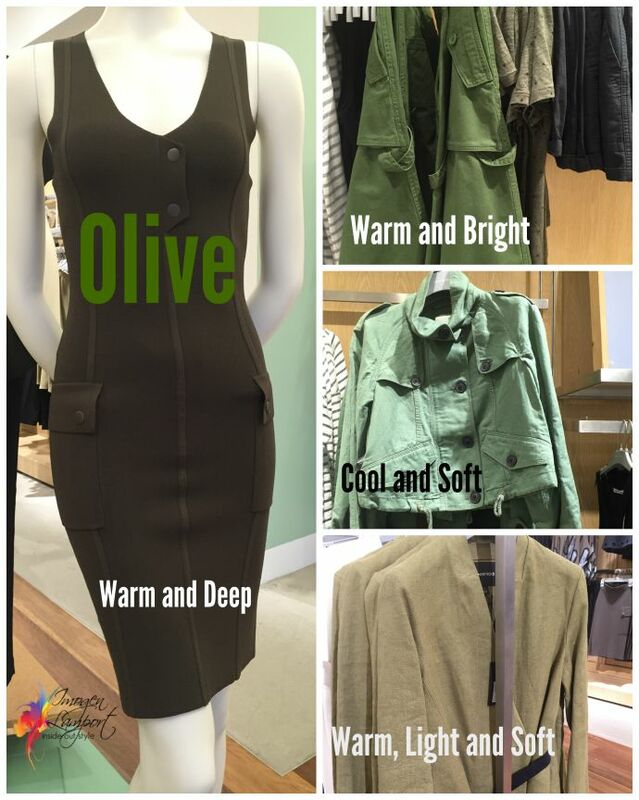 The other day as I was walking through my local shopping mall I glanced in the doorway of Country Road (the Australian version of J Crew or Banana Republic) and discovered that it was awash with olive/khaki type greens. Pantone had forecast that Dried Herb would be a big colour this year, and here it is for the Australian Spring/Summer in its many shades and I’m also seeing it in the Autumn/Winter collections for the Northern Hemisphere. The Pantone version is definitely warm, but interestingly I’m seeing some cooler versions here in stores and so I wanted to show you the differences so you can look out for the most flattering version for you. This khaki green is a brilliant neutral for you if you are warm – particularly if you have an olive green or hazel eye – as it will be a fabulous eye enhancer, so snap it up while it’s in the stores! Here are some ideas on how to mix Dried Herb with other colours in your wardrobe. It goes brilliantly with the warm military navy of Reflecting Pond. This is so helpful Imogen!! I’m warm colouring (medium copper/auburn hair and medium-dark blue/grey eyes) and I always gravitate to khaki/olive clothing when I see it in stores thinking “oh that’s a warm colour, it will suit me”. I have tried on (and sometimes bought) the more sage green and also the muddier warm/light/soft green before and was disappointed when it washed me out. I now try to stick to the warmer brighter more medium olives and they are great. I love seeing these colour comparisons – an excellent reminder. Olive is the new black, in my closet! I love khaki but find it really hard to wear with my colouring, being Bright/Cool with dark brown hair, lighter skin and a turquoise eye. Any suggestions? Wendy – it’s never going to be a great colour for you. 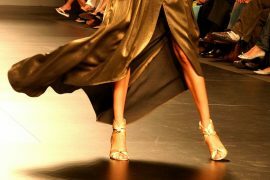 At most find a cooler version and wear it only on your lower half. Good new is we can wear black, and many women envy that ! Thanks for this Imogen. I have adored olive and khaki trousers since forever. My best pair was from Country Road in around 1980 and I wore them for years. I bought a pair of J Brand khaki jeans on sale last year out of nostalgia for the CR pair, so I’m glad I will be on trend! Of course the first thing I click on is the $3,194.4691 AUD Alexander McQueen jacket……….Swoon! I have the same champagne taste and beer budget. But I can enjoy looking! I can relate to the champagne taste comment. I’ve just bought a lot of basics in Targets Lily Love range. The tag says muted olive. Its like your warm and bright but softer yet not as softer and greyed off as your cool & soft (above). I love it on me. It made my skin come alive… yet I can also wear black and clear bold colours too? Although I have to wear heavier makeup to compensate – with the soft salmons, plums and dusty olives and peaches, makeup becomes less necessary. So, if you have ever seen the lily loves range in Target, can you tell me where they fit in, with your categories above? I would think soft autumn? Hi Meredith, the Lily Loves olive is soft – it would fit in my Spicy and Exotic ranges – Soft Warm & Toasted (I don’t do seasons so can’t comment on Soft Autumn). Yes. I was told that today by the optometrist assistant. First time in my life I tried soft, warm glasses in muted autumn tones & what a difference. My face wasn’t “swallowed” by frame. It really does save time & money. The right colour frames make a huge difference! For years I’ve worn olive green as my black.,,so pleased to hear there will be plenty in season.